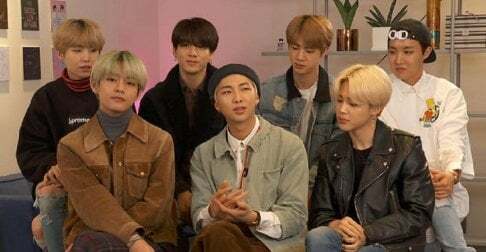 In what moment did Halsey fall for BTS' RM? Last year in August, the American singer who featured in BTS' record-breaking song and MV for "Boy With Luv" confessed in her interview with 'MYX Philippines' that her bias was RM. After initially reacting that she "can't pick one", Halsey later whispered to the interviewer that it was actually RM. Previously, the singer had encountered BTS when she and the boys did a gift exchange. Halsey gifted them some yummy churros, while the boys surprised her with a box full of Korean snacks. But, before Halsey unveiled her gift and uttered, "I brought you guys a present," RM immediately expressed his gratefulness and said: "Really? But, you're the present!" According to the K-netizens, Halsey's reaction after RM's comment revealed her true "fangirl moment". Other comments include: "So sweet", "even my heart flutters just by watching this", "I am so envious of Halsey T_T", "Meanwhile, Halsey looks so pretty too", "her reaction is so cuteeee", "a successful fan". "No wonder! Halsey looked so happy. LOL, (recently) She also did a handshake with her bias. Career satisfaction level extremely high." Would you also keep your ultimate bias forever if s/he had that kind of reaction? so sweet >_< omg, and she is so nice making them feel welcome and happy.